Let’s take a look back at the last twelve months and see who we are and what we achieved in our best year yet. Voog is a small, agile, fast-moving pack of specialists. Our team is now 11 people strong. Welcome on board, Veiko, Sirje, Ott and Henn! Speaking of human resources — now we have more kids than there are Voog team members. Last year four kids were born, pushing the total to 13. Welcome, Jakob, Mihkel, Priit and Marta! Last year we launched great new designs, added many useful features and polished the whole experience down to the smallest details. Our efforts have not gone unnoticed — just last week our rating was upgraded to 5 starts and Voog got listed as one of the TOP3 best website builders by WebsiteSetup review site. Another great review site — SiteBuilderReport — lists Voog as one of the 4 best tools for creating a website, especially for multilingual sites. About 700 new paying customers signed up with us from 80 countries. So many of those sites are remarkable masterpieces. Actually, all websites work magnificently with Voog no matter if they are created with our beautiful standard templates or have a completely unique design built by any web agency. 2015 was indeed a great year of growth for us. 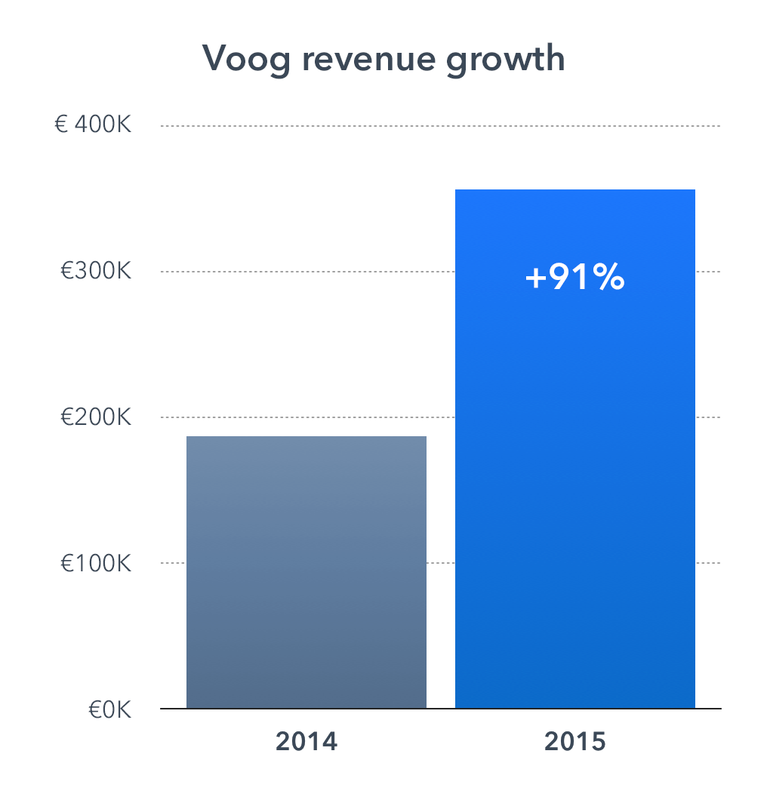 Our revenue increased by 91%, reaching €350K. It means we have a lot more capacity to push forward with product development. 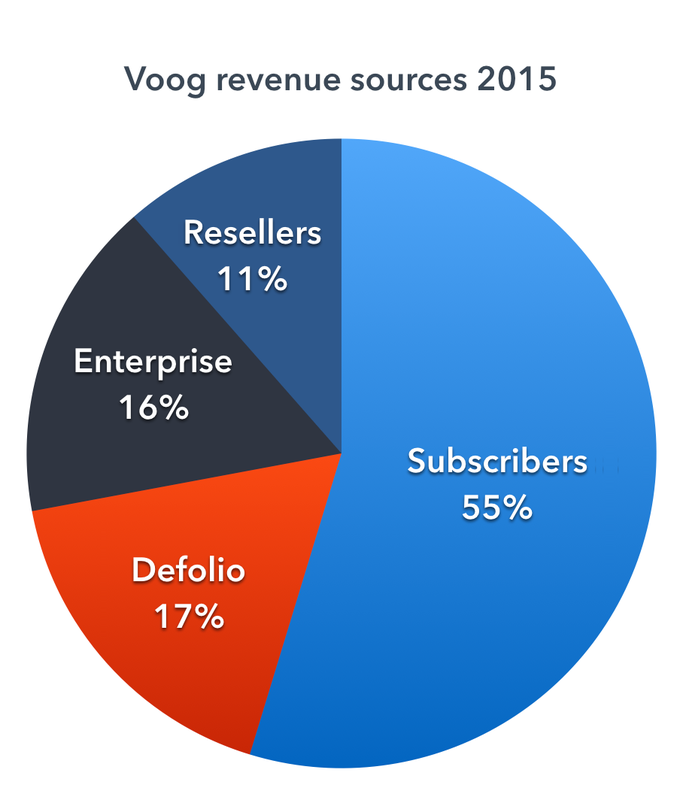 Besides catering our own users there are four hosting companies reselling Voog to their customers on their own. Dozens of design and web agencies are building their customer websites on Voog, a trend taking off after the first two Voog Developer Days in Tallinn. In addition to building Voog, we also launched its little side-kick last year. It’s called Defolio and it’s a web service for running creative competitions for design awards, ad festivals and photo contests. Three regional and one global festivals already use it. Beside Voog and Defolio we provide a few custom solutions to a handful of bigger customers. The greatest gig in 2015 was building the web systems of Societly, a tool used among others by Fox News. Created by scientists from the universities of Tartu, Stanford and New York, Societly helps millions of Americans match US Presidential candidates with their personal values and preferences. We’ve been busy preparing some massive new features to be released this year. The first batch will be ready by Spring, so stay tuned!